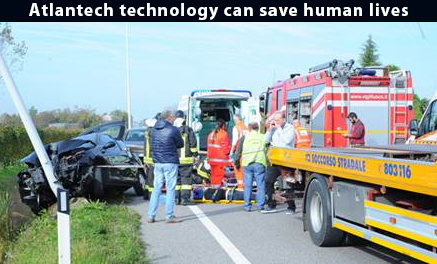 Atlantech Lux technology has been tested by GDTech, one of the most advanced laboratory in Europe as far as passive safety test in case of road accident is concerned. The crash test results prove that Atlantech Lux devices compared to the traditional concrete plinth are able to soften the force of the strike generated by the impact against the lighting column, converting a standard lighting column (in passive safety class 0) into a safer column for the safety of the passengers. The standard on the passive safety UNI EN 12767 generated on lighting columns European market, the development of new supports with passive safety but with cost much higher than those of the standard lighting columns. The result was that ,because municipalities have at their disposal more and more limited resources, in Italy and in other European countries the passive safety columns are difficutl to be introduced in the market because of budget reason, to the detriment of public safety. In this scenary Atlantech Lux represents a real technical revolution in the field, which, in addition to the befits already provided (display), is able to save human life. Do not hesitate to contact us if You need further clarifications.